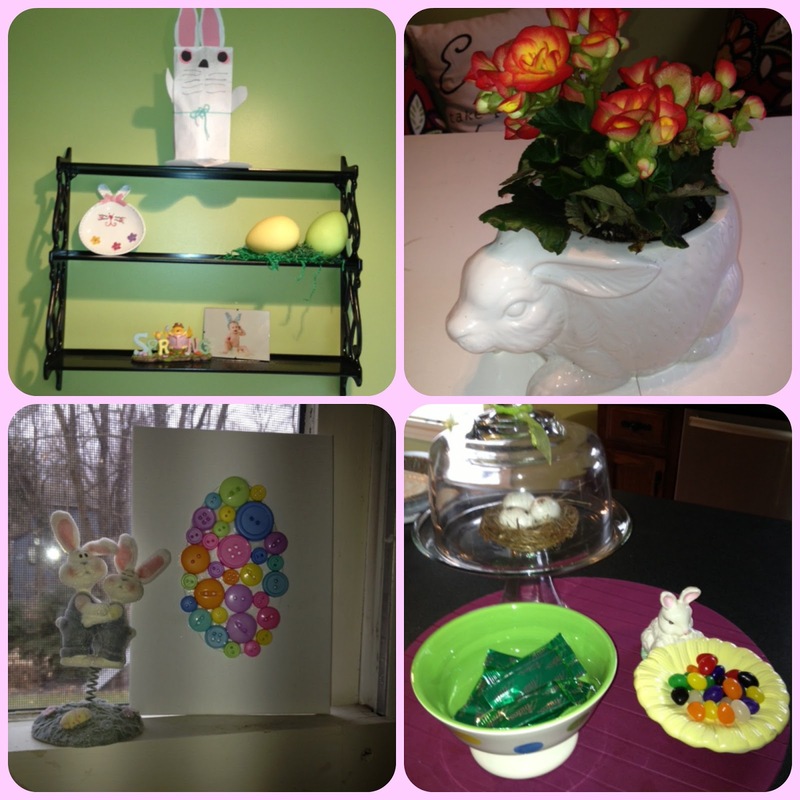 Whether Spring is visible outside or not... Spring is definitely visible in OUR house! I put up our Easter decorations the day after St. Patrick's Day, but man are the two holidays close together this year! I still haven't even put my tubs away nor have I finished all of my DIY projects with the kids for Easter AND it is less than a week away!!! Oh well... there's always next year, right?!?! Anywhooooo, we are counting down the days until Easter arrives! 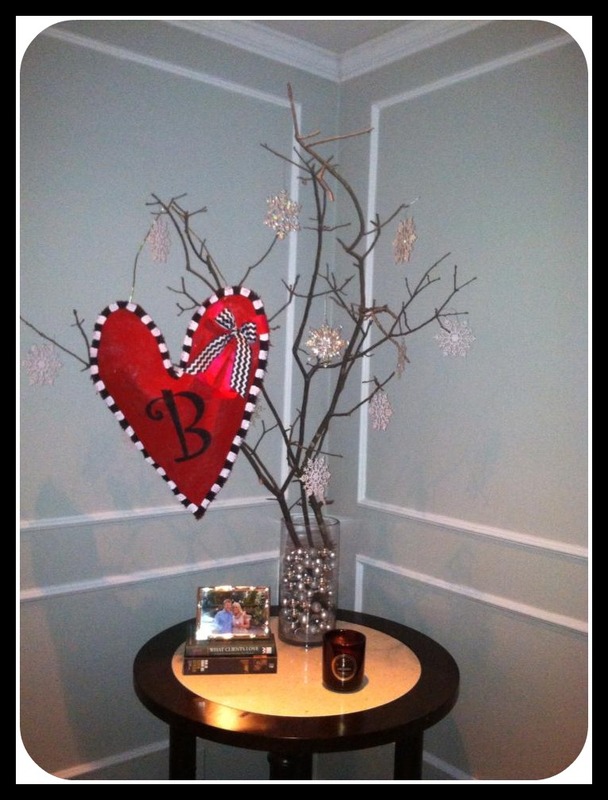 My decorations are very simple and cheap for this wonderful and happy holiday. Everything you see below came from Michaels and it was all 80% off! I bought everything at the end of season last year. I love my pots! This fake grass stuff is way cool! It fit right into the pot and I added the eggs... Egg-celent, right???? HAHAH!! The eggs on the trees were super, super easy... 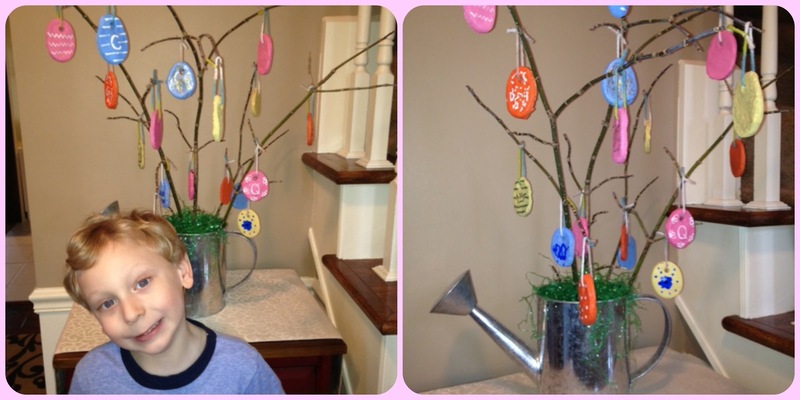 EGG + RIBBON + HOT GLUE = hanging eggs. The kids loved throwing them into the branches! 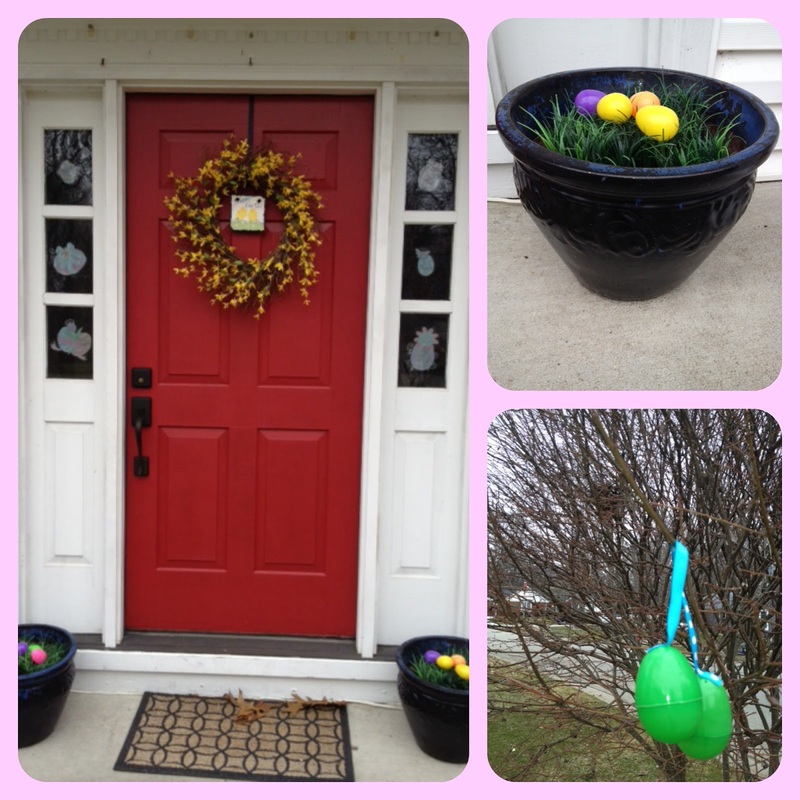 Look at the Egg Tree Charlie and I made for our entryway!! We had so much fun doing this together! It's messy, but totally worth it! I just posted a few pics from the house below. Most everything you see here was purchased at Goodwill. You never know what treasures you are going to find!! Charlie made the button egg last year for the Grandparents. How fun are these rabbit rolls we had for dinner??? I like to surprise the kiddos with silly things throughout the week leading up to the special holiday. 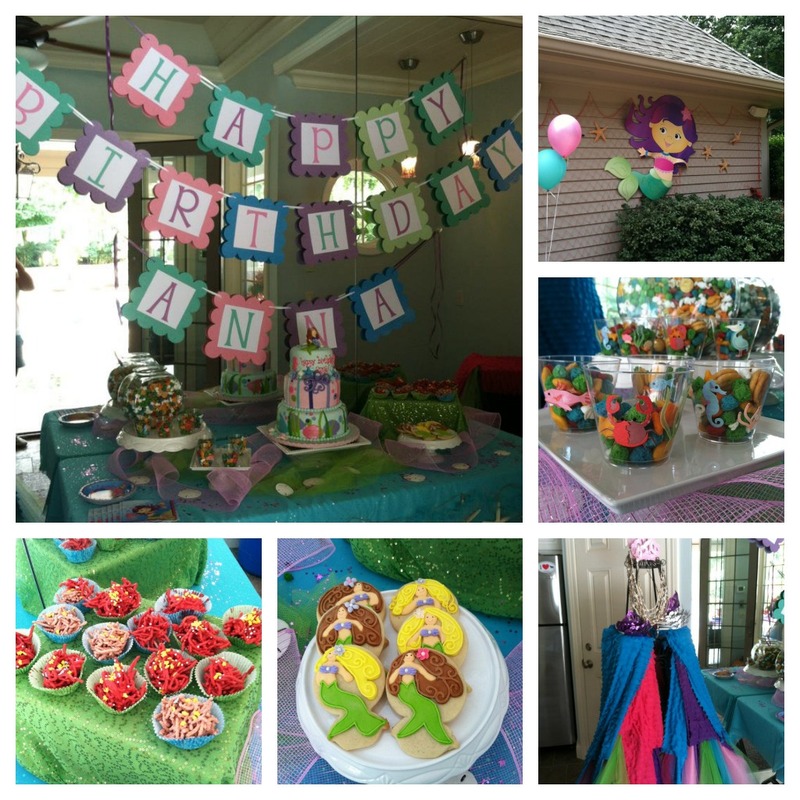 It's amazing how some cute Easter plates and napkins, window clings, and even fun shaped foods can make a child's day! OK! Who doesn't love egg hunts?? I'm not gonna lie... we have been practicing egg hunts a lot around here. Hahah I hide after-lunch snacks like M&Ms or fruit snacks. The kids ask for it almost everyday! This year I decided not to do baskets. Charlie is really into backpacks these days. He has been carrying around an old diaper bag with milk stains in it so I decided his very own backpack would be perfect... and of course it is blue so I know he is going to love it! Quinny is getting a zebra bag!! She is at the animal stage so I can imagine the sounds she'll be making. :) I found both on Amazon. I love finding new things for the kids. Of course I have my staple Easter items: bubbles, new crayons/markers, sunglasses, and books. Every year the kids are into new things so I take off on that and splurge a little. This year Charlie is into reptiles. I found a lizard for his room at Hobby Lobby for 4 bucks! The green alligator is a shirt. They are hilarious! It's a t-shirt with a hood to look like the animal. I bought Quinny one, too and hers even has wing-like things when you open your arms!! Q is really into Minnie and coloring so she got some Minnie silverware and special markers that can't mark my couch!! Because of the age gap between the two kids as well as the competitiveness in my son LOL... I am going to do separate eggs for each kid. I will leave a note from the Easter Bunny and have Charlie find the sport/colored eggs and Quinny will find the animal/sparkle eggs. That way they both get a chance and I can make C's eggs a little harder. I have all sorts of things besides candy in their eggs: stickers, coupons for special things, grow capsules, squishy bugs, hair things, necklaces, change, crackers, and more. My favorite place to find little things is at the local Party Store. Finally, for my religious friends/family out there... these two books are by far the best I have seen out there to connect the Easter Bunny to Easter as well as everyday Lenten ideas that are easy to do and easy to understand. My mother-in-law recently gave me these and they are perfect! Both are at Amazon, too!! If you have any ideas for Easter baskets and/or eggs please do share!! I am well aware that the name Schoenle is not Irish in the least, however... my mother's maiden name was Murphy. You can't get anymore Irish than that? Am I right??? Clearly, I love holidays and yes, I decorate for even the small ones. It makes life more fun! Well, let me tell you... my house became a lot more Irish and a lot more fun with this super cute Shamrock for my front door. Isn't it adorable? 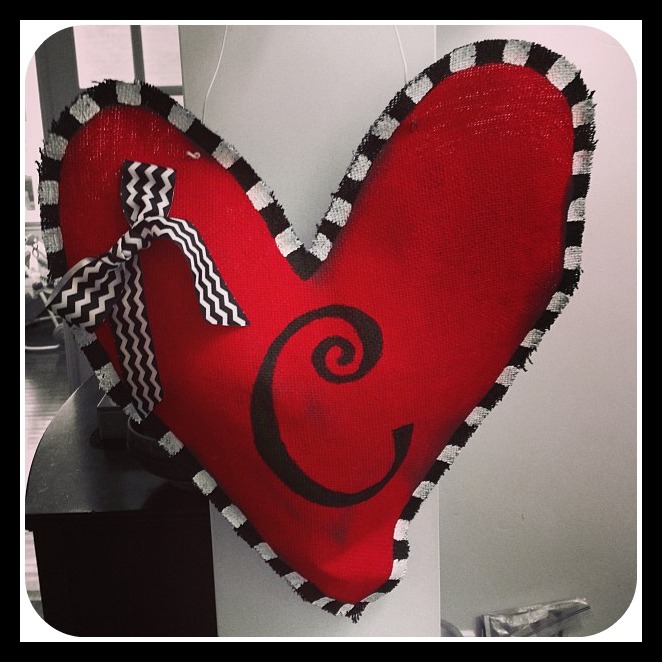 It is hand-painted on burlap! I love the ribbons to hang it, too! How about the black and white details that make it POP???? I have had so many neighbors stop and ask me where I found this adorable and festive piece. Not to mention... if you drive around town they are popping up everywhere! They are spreading like wild fires, and how can they not when they are so dang cute?!?! Well, here she is... the one and only Gabrielle. Isn't she stunning? Just like her work! This is one crafty chica. 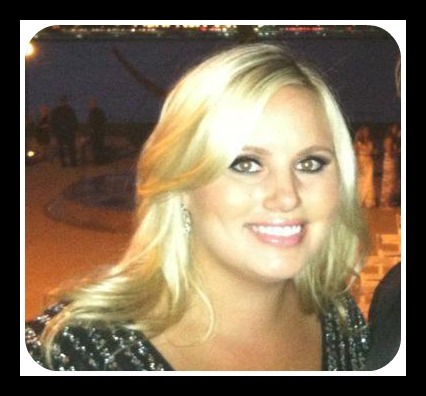 She is currently a nanny for 4 rambunctious kiddos as well as a self-employed party planner. 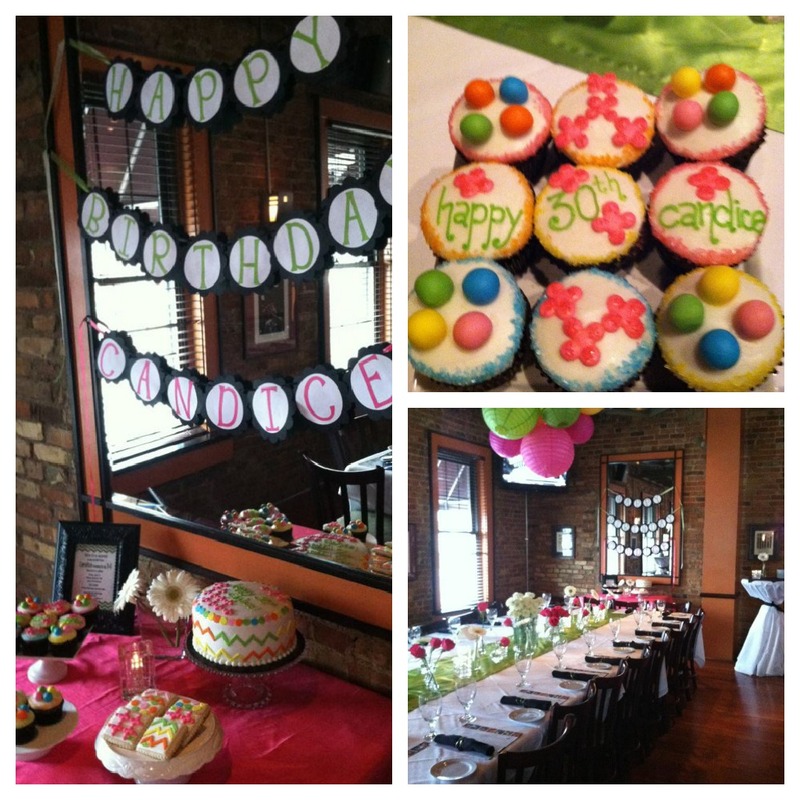 Check out some of her parties! Isn't she amazing? 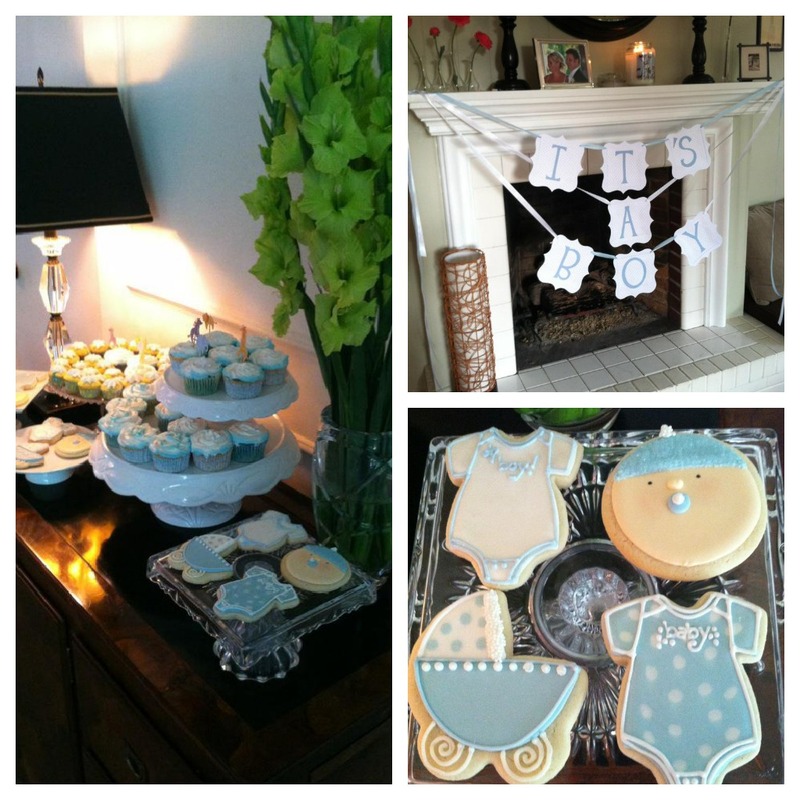 These pictures could be in a Martha Stewart Magazine! 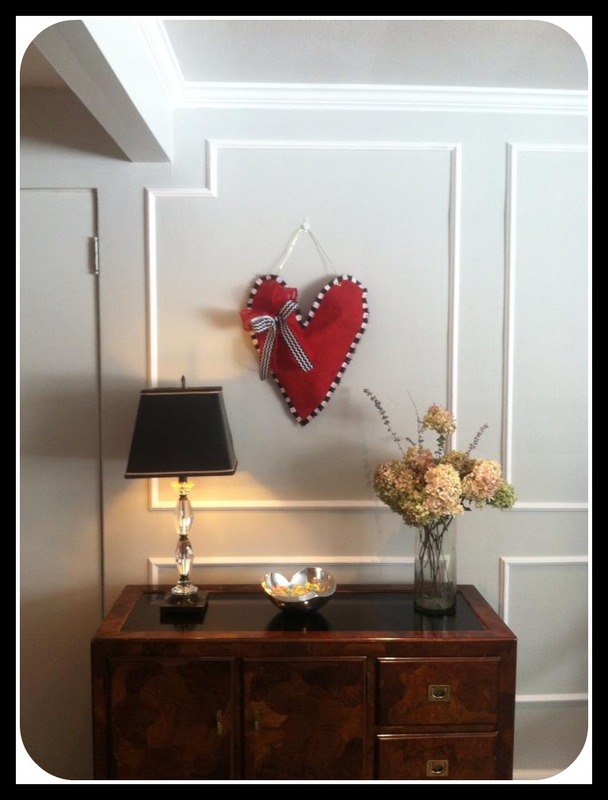 Not only did she make Shamrocks for St. Patty's Day, but here is what she did for Valentine's Day! I want one for every holiday. They just bring a smile to your face. I can't wait to see what she comes up with next. Gabe, you are one artistic person and I admire your amazing work!